Six months after tornadoes devastated the Oklahoma City area, we’re looking back this week at the role of private donations in the recovery effort. Gary England calls for donations May 20, 2013. When the storms hit, the media were some of the greatest sources for information. They assumed authority, provided immediacy and acted as a clearinghouse for the influx of data. But in part two of our series today, we investigate whether the media’s response was as efficient as it seemed to be. When the magnitude of the May tornadoes became evident, News 9 anchors jumped into action. Meteorologist Gary England called for all kinds of donations and watched as viewers responded. 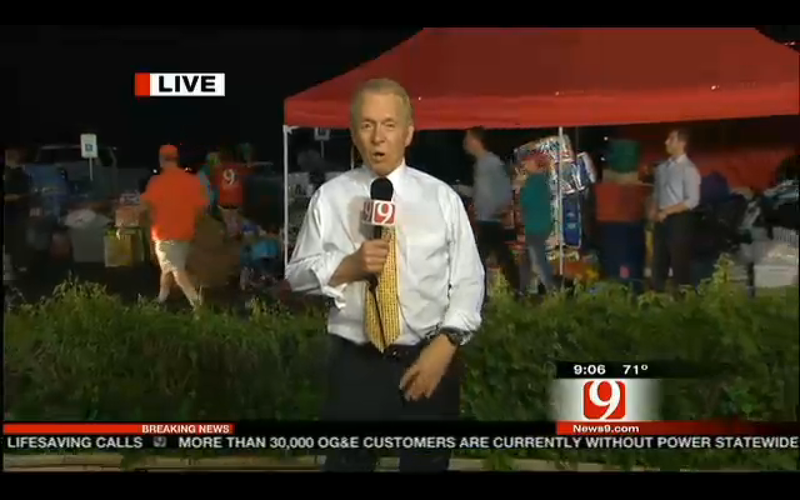 “Obviously, we’ve suffered a major tragedy,” England said in an archived clip of News 9’s coverage from May 20. “It does happen, as we’ve talked about, in this part of the world and other parts of the world too. The good thing is we all support each other, and we appreciate anything you can do, anything you can give, big, little or whatever, just a prayer, it’s all good,” England said. So truckloads of help came pouring in, and for the team at News 9, it was all good. They had plenty of room in their driveway, and the staff had the manpower to help unload the donations. Houston Hunt is the VP of Marketing for Griffin Communications, KWTV’s parent company. He says the internal discussions that preceded the call for donations were incredibly brief because of the channel’s responsibility to the public. This was an easy decision for KWTV, in part, because it acted as a middleman for the donations’ ultimate destinations. People dropped off goods, and employees at News 9 sorted through the products and passed them on to non-profits in the area. Hunt says station staff made a decision to accept anything people were willing to give. But Erin Engelke with Feed the Children says that may not necessarily be the best approach to take when it comes to disaster response. Engelke says this miscommunication continued even after the immediacy of the storms had subsided. “So for the weeks that followed the May tornadoes, the message of need around continued in spite of the fact that for most of the non-profits around the City, including Feed the Children, there was almost no room to store the donated items,” she said. From the standpoint of private charities, Engelke says one lesson from the tornados is to coordinate better and set clearer guidelines in the first place. “Going forward, it’s important for all of the agencies who are on the ground responding to the disaster to have the same message, for all of us to be on the same page, to communicate to the media exactly what the needs are and also to question them when they start communicating a message that is different than what the need actually is,” Engelke said. Lacking a better communications plan, non-profits throughout the region are now left with millions of dollars of donated products, for which both they and storm survivors have little use. Six months after a series of devastating tornadoes touched down in Central Oklahoma, we’re taking a look back this week at the recovery effort. In the aftermath of the storms, private charities raised close to $70 million, and tens of millions more in in-kind donations poured into the region. But some of that aid was more helpful than others. In part one of our series today, we look at local businesses who donated their proceeds and the balance between good public relations and an altruistic desire to help.